WEST LAFAYETTE, Ind. 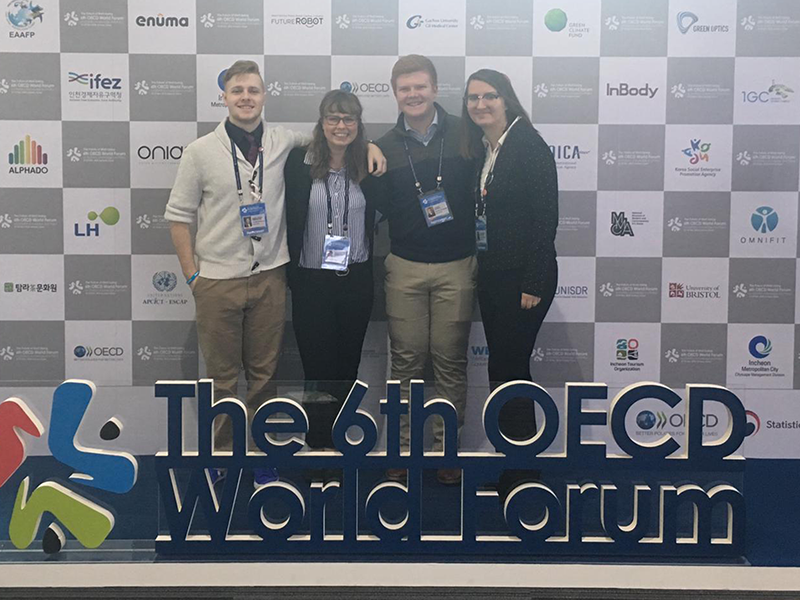 — Purdue Honors College Dean Rhonda Phillips and four Honors College students presented research at the Organization for Economic Co-operation and Development (OECD) Sixth World Forum on Statistics, Knowledge and Policy this week. Honors College students Marly Beck, Kaylee Brunsting, Jeremy Dewell and Angus Pinkerton presented research findings, taking a giant leap as the first undergraduate students that have presented research posters at the event. Through this participation, the Purdue Honors College discussed policies that impact quality of life in countries across the globe. The OECD gathers world leaders and experts from all sectors of society to help define policy and collective action. This conference, which began in Palermo, Italy in 2004, rotates among the 36 Organization for Economic Co-operation and Development member countries. 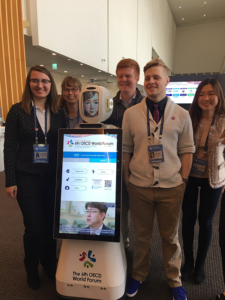 The current World Forum on Statistics, Knowledge and Policy takes place at the Songdo Convensia Convention Center in Incheon, Korea, and is specifically focused on increasing well-being world-wide. Dean Phillips presented her research on community well-being as part of a panel addressing, “Happiness in Public Policy: A step-by-step guide based on experience in the happiness movement.” Dr. Phillips is well versed in this arena, as she is the past president of the International Society of Quality of Life Studies, the co-founder and co-editor of the International Journal of Community Well-being and serves on the Board of Directors of the Happiness Alliance. Each of the four Purdue University Honors College students who presented their research are members of a research class guided by Dean Phillips. Beck, a junior studying sustainable food and farming systems as well as global studies, explored alterations to food systems that can improve an area’s sense of community, specifically targeted for immigrants and refugees. The research has yielded policy recommendations for four steps of food systems, including adaption, production, at home cooking, and consumption. Pinkerton, a sophomore at Purdue, is studying civil engineering and history. His research focused on how various indices ranked modern nation’s standard of living and related that to their current political and economic structure. He found that countries with less economic freedom and more oppressive regimes tended to have lower standards of living as well as lower levels of happiness according to the Happiness Index of 2018. His poster is available here. Established in 1961, the OECD maintains its headquarters in Paris, France. It operates with a 374 million euro budget contributed from its 36 member countries. 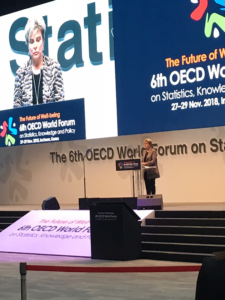 The mission of the OECD is, “to promote policies that will improve the economic and social well-being of people around the world,” through working with governments to understand the factors that influence social, economic and environmental change.